Mens Diamond Wedding Ring, Custom Wedding Rings For Men With Gems And Diamonds. Mens diamond wedding rings would be much more popular if you could get an affordable price tag for a good diamond ring. We used the term 'good' because you can get a cheap mens diamond wedding ring that is low on quality in every aspect be it, metal weight, craftsmanship or diamond quality. 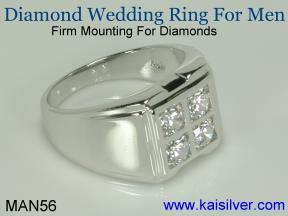 The Kaisilver MAN65 Diamond Ring for men, is a classic ring with good looks and durability. This ring is surely not cheap but, it boasts of a price tag that is far lower than you would imagine. When we talk of a good mens diamond wedding ring, we refer to a jewel that has good looking natural diamonds. The ring would also have a healthy metal weight to make it strong and durable. This automatically rules out light weight junk diamond rings with very low grade diamonds. Many of the features incorporated into this mens diamond gold ring, work quietly in the background to deliver more value to you. For example, many jewelers might tell you that they can make a similar, mens diamond wedding ring with half the gold weight that we offer. While it is true that the lighter diamond ring would be cheaper, it is even more true that insufficient metal weight would make your men's diamond gold ring prone to denting and deforming. 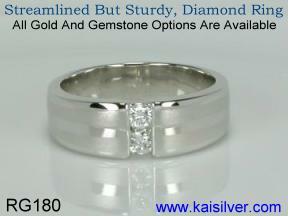 You can order a men's diamond wedding ring in gold or 925 sterling silver. The same diamond quality and workmanship are maintained for both metals. The diamond men's gold ring is available in 14k or 18k gold and all 3 gold colors. The gold diamond ring can have a single tone or two tone gold color. Select 3.5mm or 4mm round diamonds for your men's wedding ring. One or all diamonds can be replaced with gems of your choice. The silver diamond ring can be plated, the plating will wear off after a while. Each ring is made to order, we can accommodate all ring size requests. We can also custom make your diamond wedding ring with your own design. The image shows the MAN65 Kaisilver men's diamond wedding ring in two tone gold. Since each diamond gold ring is completely tailor made, you can request for a full yellow gold or full white gold diamond wedding ring too. While we do offer options for 18k and 14k men's wedding rings with diamonds or gem stones, you should know that 14k gold is harder than 18k gold. It is therefore true that the 14k white or yellow gold mens diamond wedding ring, would be stronger than a similar ring made in 18k gold. Having said that, we would like to add that the healthy gold weight provided for our rings, ensures that durability is provided for both 14k and 18k gold options. This diamond mens ring can also be custom made with gem stones replacing some or all of the diamonds. This allows you to create a mens wedding ring with one or more birthstones. A diamond has significance in wedding rings as it is a precious gemstone that is associated with eternity. A marriage is a solemn promise from the wife and husband to share the rest of their life together. A diamond wedding band could itself be a birth stone wedding ring if, you were looking for an Apil birth stone. When we say that your 14k or 18k mens diamond wedding ring is custom made in all ring sizes, the statement seems to be quite simple and unimportant. However there is a big difference between custom making a ring to a particular size as compared to, doing a mere resize on an existing ring. By specifically crafting a ring to include all your preferences, we are able to provide a gold weight that is porportionate to the ring size required by you. For example, if you wanted a large mens wedding ring with a size of 14 or even 15, our support experts will advise you if any additional gold weight is required to maintain the durability of the jewel. We will not take a size 9 mens diamond wedding ring and merely resize it to a size 14 as required by you. You can get more information on the MAN65 mens diamond wedding ring at http://www.jewelry.kaijewels.com/mens-diamond-ring-14k-18k-05.htm Do contact our support team at sales@kaisilver.com if you have any doubts or queries. Do not hesitate to get all your questions answered, as you will never be pushed to make a purchase. Very few jewelers care to provide the kind of detailed information and advice that we do, this is all the more reason why you should take complete advantage of our expertise. Below are a few more suggestions for your mens diamond wedding ring. Just keep in mind that we can custom make your diamond mens ring with your design or ours. The designs shown below can also be modified to suit your preferences. 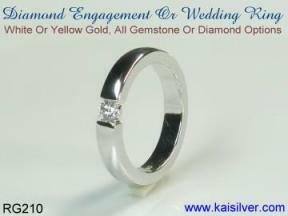 All Kaisilver jewelry is available in 14k or 18k white or yellow gold. Yellow or white gold, diamond ring for men. Suitable for mens or ladies, 14k and 18k gold diamond rings available ... more. A great choice for an affordable men's diamond gold ring. Both 14k or 18k diamond rings available in yellow or white gold ... more. A bold mens diamond ring, 4 diamonds set closely on a broad ring face. Customization allows some or all of the diamonds to be replaced by gems ... more. Kaisilver custom jewellery is crafted in gold or sterling silver, with gemstones of your choice. Since we procure gems directly from the miners, there is absolutely no limit on the type or grade of gem that we can procure for you. Our extremely talented team of jewellery designs is well supported by a team of highly skilled craftsmen and artisans. While you can choose a design from our collection and request for any modifications that you need, we also welcome your own images and sketches to be custom made. Get in touch with our support experts at sales@kaisilver.com and get guidance and information regarding your gem and jewellery requirements.